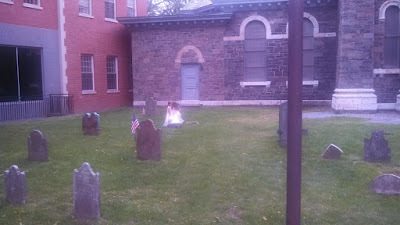 It was a several centuries old graveyard in Philadelphia that I had always meant to explore. Tonight I hesitated, though, because it was nearing darkness and there existed a rumor that it was haunted by Revolutionary War spirits. But I entered, and as I walked among the headstones of many distant figures of heroic proportion, I saw a light and two small girls sitting on the grass. Trembling a bit, I approached them. "Children," I said, "you are not of these times, are you?" "No, kind sir," replied one. "We are the children of the heroes you see interred beneath." "But why are you here?" I asked. "We have brought a message for you." "That is right, kind sir." "What in heaven's name is it?!!" "If you are going to visit this hallowed place, please make sure your fly is zipped up first!" Well, folks, I am very well pleased to present this wise counsel for you to remember any time you visit a historic, religious, or Disney-owned site anywhere in the world. Please keep this principle foremost in your mind while also keeping backmost in your mind that I went over the word limit today by, oh, a time and a half. Can I help it that the spirits of those two little girls were verbose? Verbose or otherwise, you can read some of the other Friday Fictioneers takes on the prompt above by clicking here. But first, time to check you-know-what! A light take on a serious setting. A little comic relief. That's what I like about you, Perry. You're not afraid to expose yourself to something new, even if they are ghostly apparitions. Hopefully, they didn't point in the general direction of your zipper and laugh. Now I don't know what to be afraid of! Yeah, I guess he is. But it is no prank. I was hoping it was a lot of comic relief. Oh well! Oh! So funny and so poignant right now. On Friday we're expecting a bachelor friend who has evidently forgotten how to zip his pants. Each time he visits, I must remind him to "zip it!" Thanks for the laugh. No, they did not. Just about every other female, however, did. Nice catch, Lorna Earl. Looks like it's time for a little suspension of disbelief about zippers. Nobody in this story any way! Just make sure he doesn't zip it too fast or he'll always be a bachelor! The way things are round here, your character would have been in the slammer by now, Perry. And he might not even have had an unzipped fly, either. Leave it to you to cheapen the moment. And you do it so well in only a hundred words or more. I'm in the slammer already. I didn't go that far over the word count! I'm sure that's true but I'm not an elder!!!! And all my ghosts are friendly for that matter. Thank you, Mick. A lesson for all of us. Yeah, I just need to twist it a bit and I can zip it up. How embarrassing - exposed in front of children. Phantom paedo? Although, you're lucky that they are old souls - as today they would have video'd your unzippered stance and called police, HRS, posted on YouTube, and sexted (well, maybe not). Yes, I like to zip up all the loose ends at the end! There may be two jokes in there, I'm not sure. You're reading way too much into it! This is a clean story. I dunno, I think they would have just called me out for the idiot I am. I do believe people of that era used more words, in general. They'd be no good at texting! So, I think you're excused from the word limit with this one. You're just trying to stay true to the times after all. And you have to include that last bit of advice. So important, Perry! Nicely done. Thank you for having my back, Amy, as always. That's exactly what I was trying to do --- be faithful to the era in dispensing this critical advice. Also I hate to edit. Thanks for writing. Proper etiquette must be observed at all times! Yes, indeed. All times throughout two or more centuries. I wondered if you'd do it, with the theme and all. And you did it--gotta wipe my screen, again. I shouldn't drink coffee when I read your stories. Hilarious. I really needed that laugh. I guess you weren't scared then. Thanks!